This was posted on October 8, 2018 by Teri Maxwell. The past two summers a friend offered the use of her above-ground pool to Nathan and Melanie for me to give their children swimming lessons. While we don’t go to public pools anymore because of modesty concerns, I was a lifeguard and swimming instructor in my teen years. We set up a schedule to have two lessons a week for five weeks. I worked individually with each of the four older children for a 1/4 hour lesson every lesson day. The children were cooperative, worked hard, practiced between lessons, and made great progress. Another friend with a big, inground pool allowed us to do our last two lessons there. That gave the children the opportunity to swim in deep water and for longer stretches. I gave the children home-made certificates for their accomplishments as they passed various swimming levels, and I documented their progress for Nathan and Melanie. This year my friend with the inground pool offered to let us use it for an extra session where each child could show Nathan and Melanie what they learned. 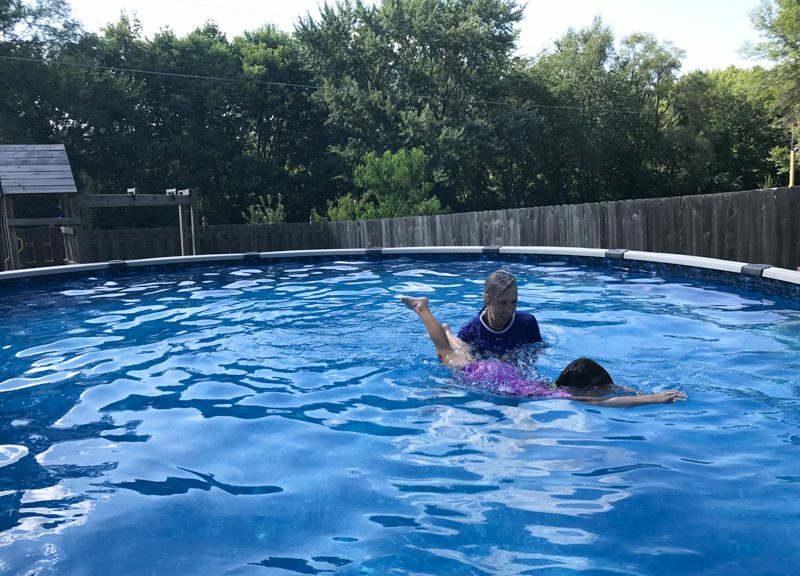 I love working with my grandchildren, teaching them to swim and helping them with skills that could be lifesaving in an emergency. Nathan and Melanie put on a family pizza party as a thank you and gave me a gift card for a haircut and another one for the coffee shop next to the hair salon. The children gave me a best-swimming teacher certificate and thank you notes. Doesn’t that melt a Grandma’s heart? That’s very cool! 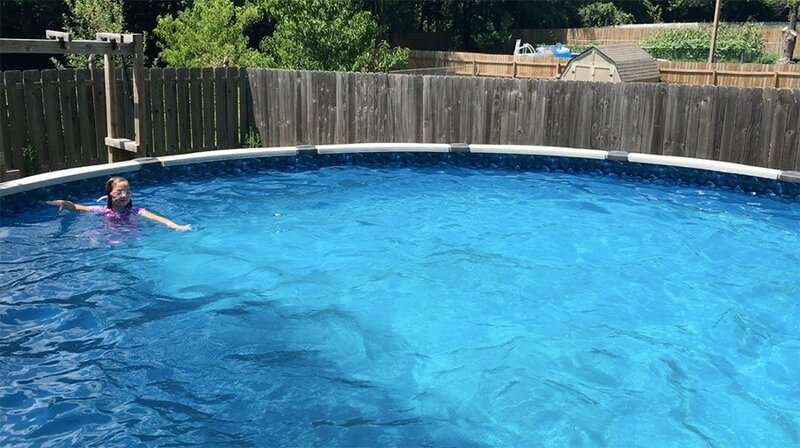 I’ve been planning to let the children enjoy swimming in a private pool of our own soon too, and find some useful swimwear now that I’ve gotten at last the firm conviction that I will not take them to a public pool ever again. I plan to have some spare proper swimwear for any visitors, so they can use the pool in modesty with us, if they want to join in! That’s so neat that you can put your lifesaver/swim instructor skills to use in the best way! This must have been such a special time and memory for the children. 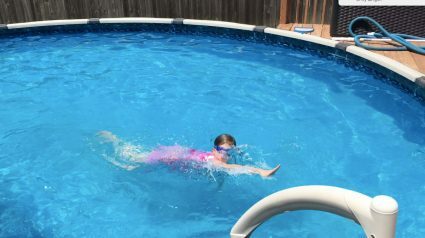 Your children will learn to swim well if you have your own pool for them to play/swim in. Such an important skill to learn,it takes a special person to teach it. And a beautiful way for the children to say thank you. Maybe my years of homeschooling lent itself to picking back up teaching swimming. I am very blessed when my grandchildren are grateful. It shows me that their parents value gratitude and are teaching it to their children. So important! Aww! That is so sweet! I’m sure y’all had such a sweet time together! What I thought was extra special is that the children were willing to work and apply themselves to learning their new skills when normally the swimming pool is play time. I totally understand not going to public pools. It is great that you have such generous friends. Do your children or grandchildren ever have the opportunity to swim for leisure or exercise? Yes, courtesy of friends with pools. Hi Teri, this is sort of random, but your mentioning of scheduling time for teaching your grandkids swimming made me think of this question. Would you be willing to post your daily schedule now that you aren’t homeschooling? I think it would be very encouraging for those ladies who have ended their homeschooling years (or nearing the end). I will put your suggestion on my list of “blog ideas.” I would like to do that if you are interested. I believe the challenge would be to present my schedule concisely since major parts of my day now vary from day to day whereas when I homeschooled they were stable Monday to Thursday with an alternate schedule for Friday. But I could maybe pick a day or two and see how that writes up for a blog post. Oh my that would be lovely to read a blog post. 🙂 I’d be curious how you change your schedule day to day. I always have trouble when my schedule has to change from one day to the other. Yes, different schedules for different days are much harder to learn than the same schedule every day. When you have to have different schedules, then it helps to keep as much the same in the schedule as you can so that just a few time slots are varying. What a wonderful thing to do! I love that you get to spend special time with your grandchildren while they learn life-saving skills. It looks like an enjoyable time for all of you! Something I remember from my children taking swimming lessons: they had the children practice their swimming one class per month wearing an extra-large men’s t-shirt over their swimsuit. This gave the children a chance to practice swimming in their “clothes” – something that prepares them for emergency situations. 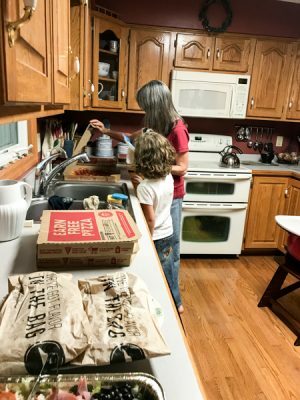 I love seeing how your family meets so many needs without compromising your values. I think many (including myself at times) think we simply don’t have a choice one way or the other. That’s interesting about the swimming lessons where the children wear a big t-shirts and swim in them. We decided next year to work on getting shoes off in the water. We tried it once this year, and it was challenging for them.